Sloped (top) and flat (bottom) abutment bridges. Introducing what will hopefully be our first of many products. We have been working on the design for this bridge for a while now and we are almost ready to start selling them. This is a very big step for us so I am very interested in what you guys think. Making something to sell is very different from actually selling it, and this has been an eye-opening process. The legal and economic steps that are necessary to open up a store (even a small one) take longer than we originally thought they would. 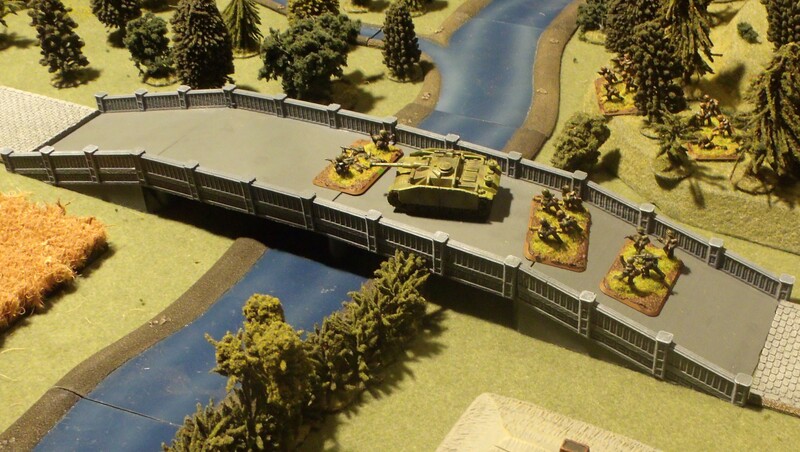 The basic 15mm bridge set is composed of five separate pieces (making it easy to store) and can be used to represent different lengths of bridges by changing the number of spans used. The normal version with sloping ramps is about 18 inches long from end to end. It can even be made longer if you get extra spans to add to the basic bridge. Because it’s so modular, we also have plans to make add on swappable pieces like ramp height extensions, destroyed and damaged sections. We also eventually want to make bunker/flack tower pieces that will transform it into a fortified bridge (think bridge at Remagen). The abutments come in two types, the standard ramp, and the level transition. The basic set will come with a matching set of your choice. The ramp is for whenever the road is at the same height as the river. This is the most useful for flat table gaming. The level transition one is for when the river is lower than the road. This abutment must be incorporated into some type of terrain feature to be used. The spans also come in two different types. The basic set will come with one of each type. At first glance they look the same, but they are actually very different. The basic span has end posts at both ends, and one of them must be used on each bridge. The expansion span only has end posts on one end, and they are the ones that can be added or taken away to change the length of the bridge. The basic set will also come with one support pier, which is used to support the bridge when the expansion span is used. These are very detailed and have a little bit of surface texture that makes them very easy to paint. Previous post: Making another type of small crystal mold. Next post: Our store has launched!